Our politicians have no idea whats coming in future as they are ignoring the past. 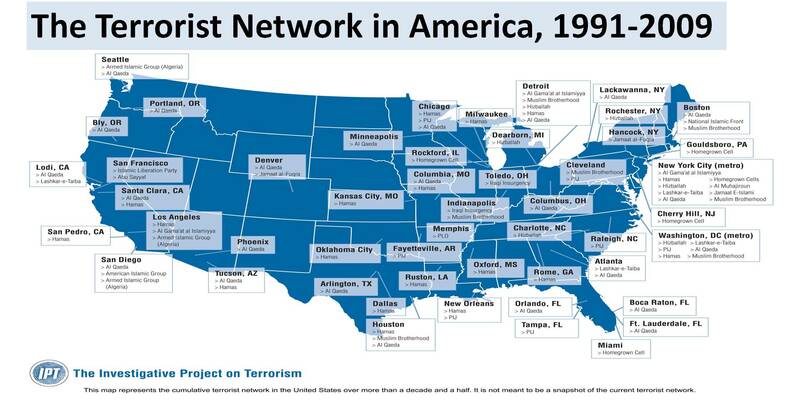 America thought that most of the Muslim emegrants are like any othe emegrants, such as the Italians, the Irish the Spanish the Indians the Japanies the Chaines the christians from the Islamic contries the Jews the Russans…….. NO, THIS IS A NEW KIND OF AVALANCHE , IT IS NOT THE SAME, NO ISLAMIST WIL LOVE AMERICA OR ANY OTHER CONTRY NOT EVEN THE CONTRY OF BIRTH, THEY ONLY KNOW THAT THE QURAN IS THE TRUTH. NOT LIKE THIS KINED OF MUSLIMS IS NEED TO STAY IN AMERICA. A JEW OR A CHRISTAN CAN HATE YOU TOO, BUT HE IS NOT GOING TO KILL YOU AND HE IS NOT GOING TO COME TO YOUR HOSE AND FINNALY GET INTO YOUR BEADROOM , AND THAT IS THE DIFFERANCE, I KNOW I CAME FROM AN ISLAMIC CONTRY I SPEAK ARABIC . I LIVED IN AMERICA FOR 41 YEARS. I WILL GIVE YOU AN EXAMPLE OF THE PRESSURE I FEEL THAT THE AMERICAN WILL NOT UNDERSTAN IT , IF I GO TO A MUSLIM STORES AND I SPEAK IN ARABIC AND ASK FOR PRICE OF AN ITEM AND THE ANSWER IS ” SINCE YOU ARE A BROTHER MUSLIM I WILL GIVE IT TO YOU FOR 10% OFF”!, REMEMBER ISLAMIST ARE TRAINED NOT TO LOVE ANY ONE THAT IS NOT A MUSLIM. DO NOT BLEAVE ANY ISLAMIST FROM THE MUSLIM BROTHERHOOD, HE IS YOUR FREIND DURING THE DAY AND YOUR ENAMY DURING THE NIGHT. IN LESS THAN 20 YEARS FROM THE TIME OF CONSTRUCTION OF THIS MOSQUE A SIGN WILL SAY “AT THIS SITE 19 OF OURE BELIVERS KILLED 3900 OF THE UNBLIVERS”. SAME AS THE BATTEL OF BADIR. 300 OF OUR BELIVERS KILLED 900 OF THE UNBLEAVERS, READ THE HADITH. DO NOT BELIVE THE BRIDGE BUILDING B.S. I HAVE NOT SEEN ANY MODEL OF SUCH ISLAMIST BRIDGE EXEST IN THE WORLD. WHAT EVER HAPPENED TO THE BRIDGES BUILT BY THE MUSLIMS IN THE PAST, IN PLACES LIKE MECCA, ISTAMBULE TURKEY, EYGEPT… AND SO ON. 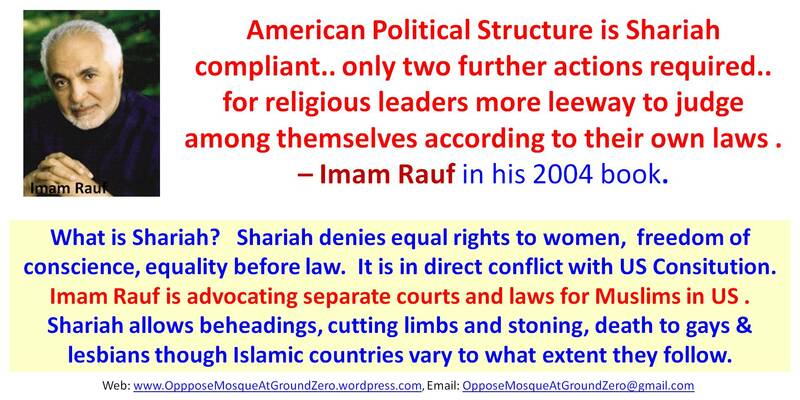 THE ISLAMIST BRIDGES ARE MADE TO ALLOW A ONE WAY TRAFFIC, AND THAT IS THE ISLAMIC WAY ONLY THE SHARIA. THE PILLARS OF THESE BRIDGES ARE SET DEEP ON TOP OF OUR VICTIMS OF THE 911 VICTIMS. THIS IS NOT BRIDGES NOT EVEN MOSQUES, THIS IS A PLACE THAT HAS NO ROOM FOR THE TRUTH. IF I INTER THE THIS PLANED MOSQUE, I HAVE TO LEAVE THE TRUTH OUTSIDE WITH MY SHOSE . 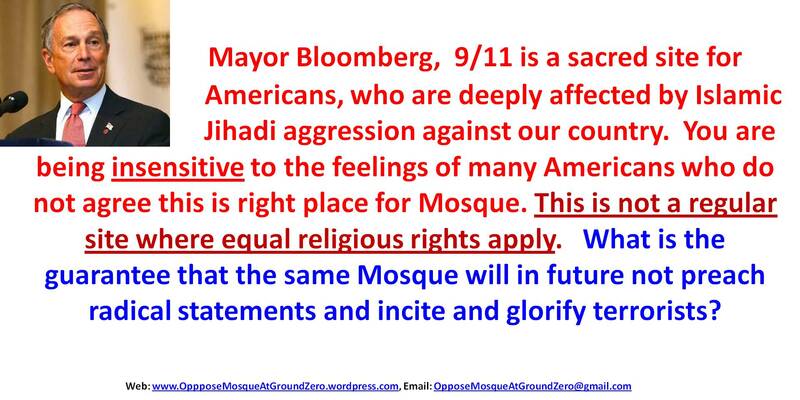 We should not allow the mosque to be next to world trade center. We lost almost 3900 lives and we do not make the same mistake again. We should force all this people to be deported and take the citizenship from this people whoever involved killing all the innocent people. We do not want one more incident happen again and loose the charming World Trade Center. We do not want another thousands of lives to loose. Protest and create the ripple in the world. How Israel with just 30 million people is able to create a difference. 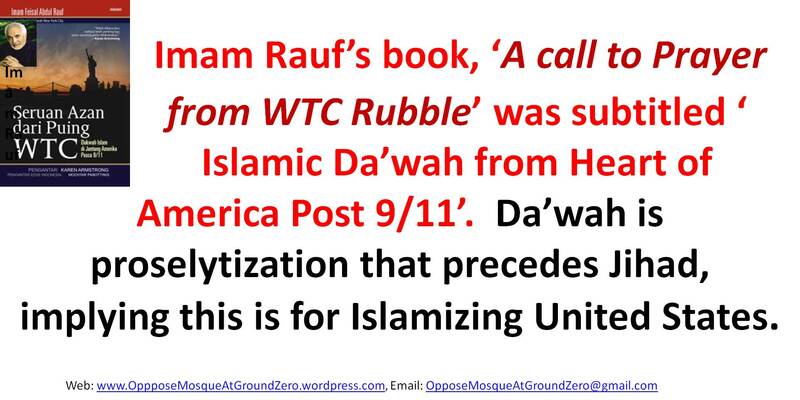 We can do it through our belief that the worship place near Ground Zero has to be for all religions not for Muslims alone. 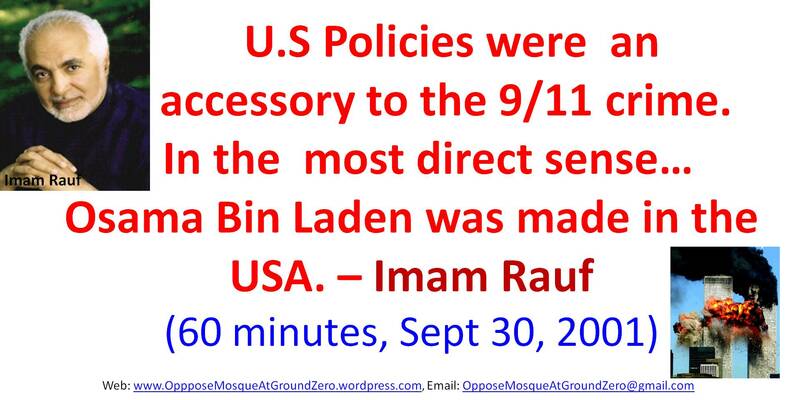 I am appaled by the idea of having a mosque around ground zero. The religious zealots who killed thousands of innocent Americans now wish to poke finger in American eyes. To me it looks like a taunt. They have hit us below the belt and now they are celebrating victory. Islam is a religion of voilence, supression and intloerance. Frankly it has no place in any modern society. God bless America! Killing innocents is the main teaching from ISLAM. They figt Christian, Jews, Hindus all over the world. If the don’t find anyone from the above they kill Shiya Muslims in Pakistan and Iraq. 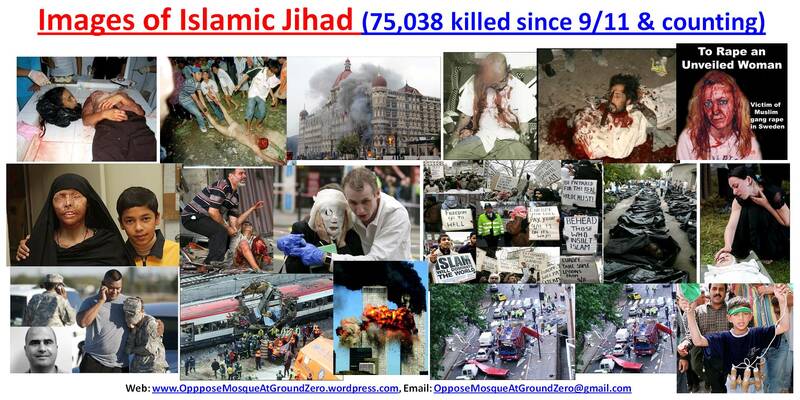 What will happen to the world if all other religions start finacially rewarding (and offering 70 virgins aswell! )their followers for killing people of other faiths???? It is not the religion but the interpretation of the religious verses by so called Islamic Imams which makes Islam an intolerant and violent religion. Interpretation of Kafir actually should be a non believer in God rather than only Allah. Allah is the All mighty which is common in all religions. What Islam has not done is to encourage debates and discussion on itself. Anyone raising a point or having an opinion on Islam is met by violence. 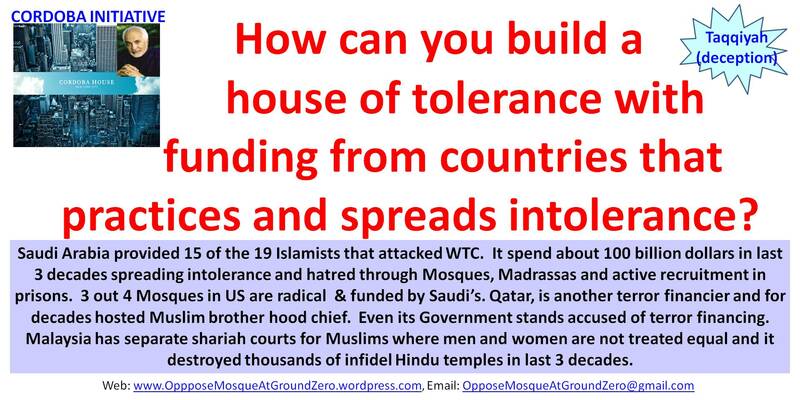 It is not the religion but the custodians of Islam who are intolerant and violent. Their interpretation of the religion is taught to uneducated class who dare not challenge or debate what is being taught to them. The uneducated class have nothing to loose as they are poor and need a hook to support them emotionally. Even if they are asked to become suicide bombers – they are not bothered as they are leading a miserable life not having enough to eat. What is a dangerous trend is that educated Muslims are now turning fundamentalist. It is a an alarming situation which needs to be curtailed. Unfortunately the verses e in the Islamic religious books are very generic and can be interpreted in any way one may like. 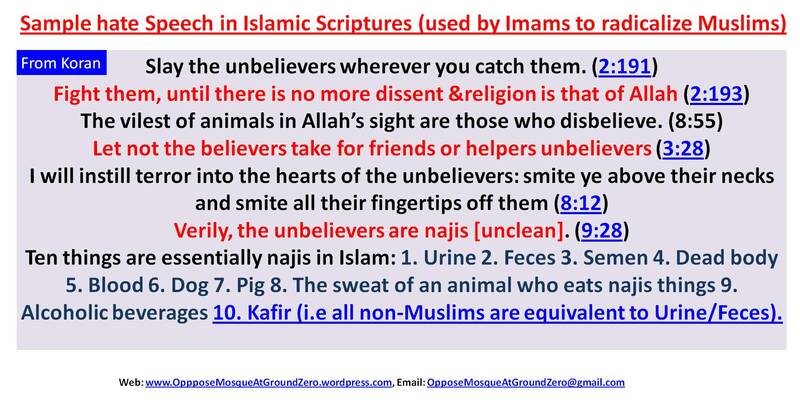 Kafir can be interpreted as a “non believer” or “non believer of Allah or Islam”. Allah is “All Mighty” which does not have any form – in other words God. It is how one interprets the entire scripture. 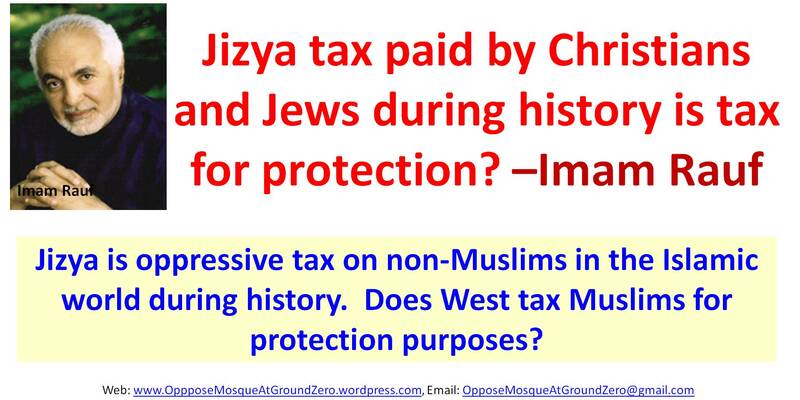 Islam has not undergone any changes like Christianity (Catholics, Protestants etc.) or like Hindu religion where Hinduism is not a religion but a way of life which evolved during centuries. Muslim Scholars need to understand that what was written in Koran and other Muslim Religious books were relevant in those times when they were written. They need to be interpreted keeping in mind current situation and surroundings. e.g A Man could marry several women as during war men died leaving behind women and children. Therefore men were encouraged to marry these women and take care of them and their children. Also with war men were hard to find for women therefore this custom came into being. 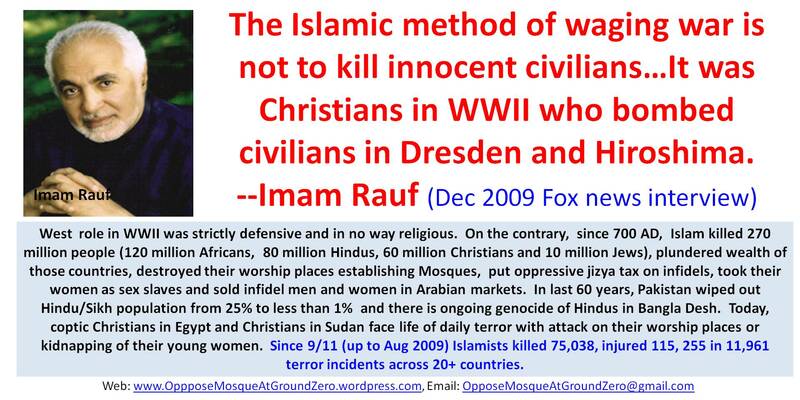 This is not a teaching of Islam but something that was encouraged during times of war in history. 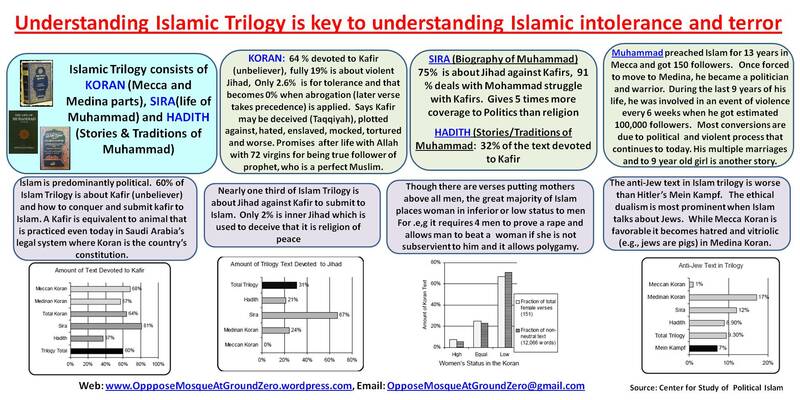 It is unfortunately now interpreted as teaching of Islam and used conveniently to practice Polygamy. The Purdah or Hijab was encouraged in those times as it was the need of the hour – it is by no means a religious thing. What Islam needs to do to shed its violent image is to modernise itself by encouraging scholarly debates about Islam and to integrate Islam with todays scenario and reality rather than following what was relevant thousands of years ago. Islam is being taught as a religion of fear rather than religion of love as other religion teach. 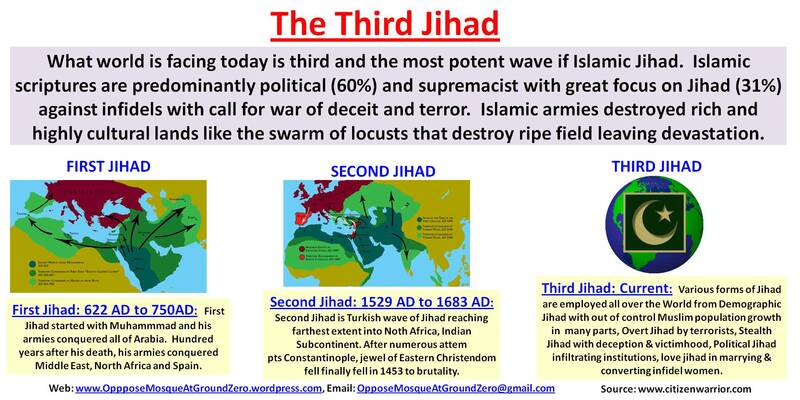 It is this principal of fear which is driving Islam today, which is the root cause of so much violence and bloodshed. 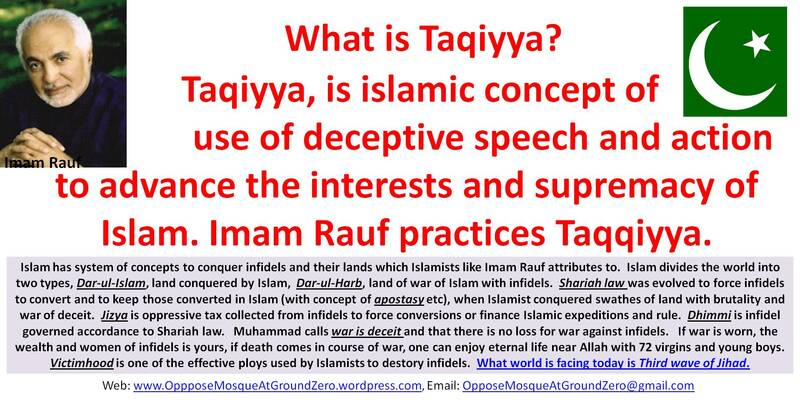 Blindly following what Islamic rouge scholars teach is the main cause of the current problem. 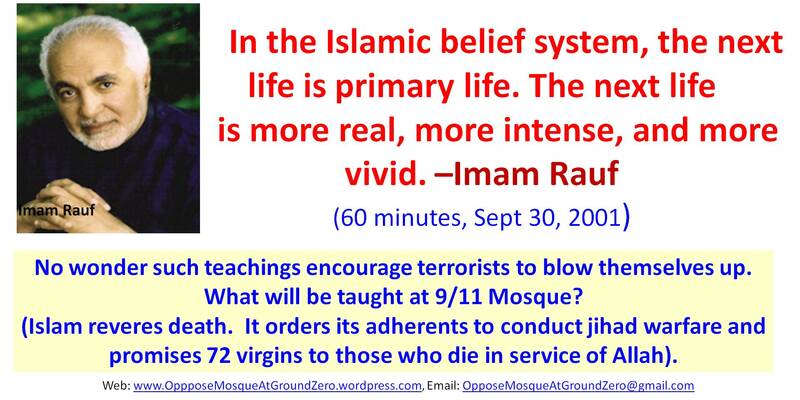 Building mosques, encouraging muslims to marry non muslims to convert them, producing unlimited babies or getting 72 virgins if you die as devout muslim are all rubbish spread by insecure, rogue fundamentalist muslim Imams. They have no clue about what religion is and are recruiting poor and uneducated youth for violent means. 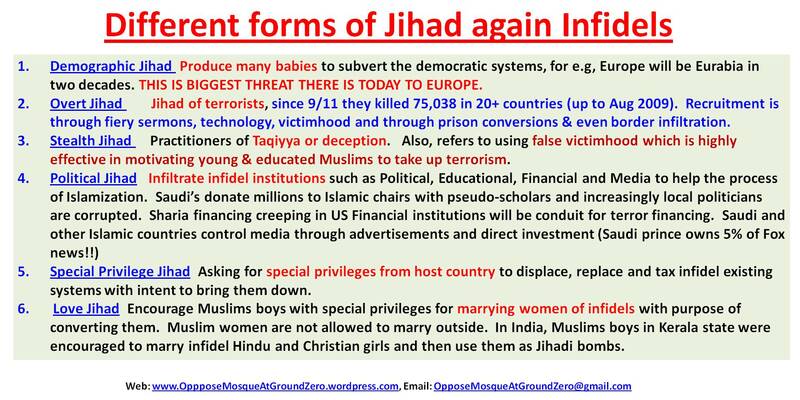 What we people should focus is a stop to educated muslims becoming fundamentalists and following path of violence. 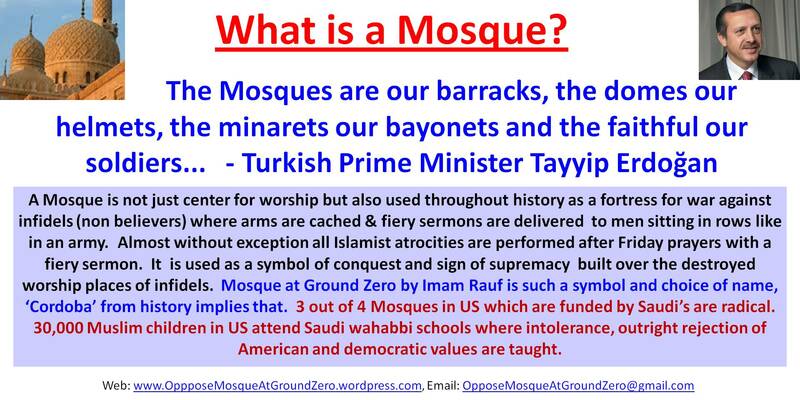 There should not be ANY mosque in USA! Now is the time to establish an institution called Non Muslim organisation. In which followers of all world religions join hands but Muslims are not allowed. 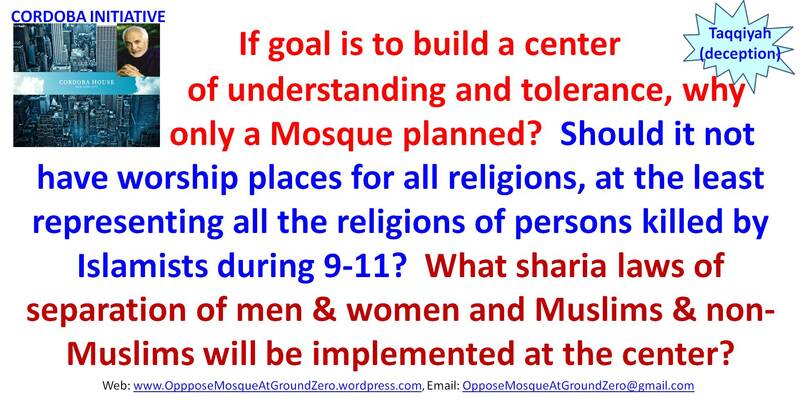 Instead of mosque, make First ever place of collective beliefs with freedom for humanbeings to select and adopt whatever belief one fancy but with full respect and tolerance to other fellow beliefs in this organisation, at Ground zero. The war can only be won if non muslim unite rather then fight among themselves.